~You’ll meet Dr. LaRock after filling out some brief paperwork describing you, your health history and your health goals. Below is the PDF for you to download, print off and fill out before your first visit for faster service. ~Next, we’ll study the way you turn and bend. We will also perform other physical, orthopedic and chiropractic tests that help us locate areas of your spine that could be the cause of a health problem and the cause of your pain or discomfort. ~X-rays may be performed. At that time, we’ll make recommendations and offer you treatment options. ~You should obtain some relief of your symptoms following your first visit. ​~ Everything is excellent. 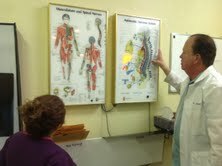 Dr. LaRock is a wonderful man and is extremely helpful. 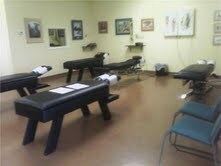 I have been going to him for a few years now for lower back pain/issues. It is quite cheap (compared to other chiropractors) and the service is great. And one of the things I really like is that they are fast. I go once every few weeks and I am in and out in usually 20 minutes. Unlike most other doctor's offices where you have to sit around for a while. They get you in fast. I highly recommend this office.